By accessing and using The W Cinema website the Customer accepts and agrees to be legally bound by the Terms and Conditions and acknowledges that the owner and administrator of the website, has the right to amend or vary these Terms and Conditions and any of the contents of the web site from time to time at its sole discretion. Cinema tickets are sold by The W Cinema and can be purchased by the Customer via the online booking system using credit/debit cards. 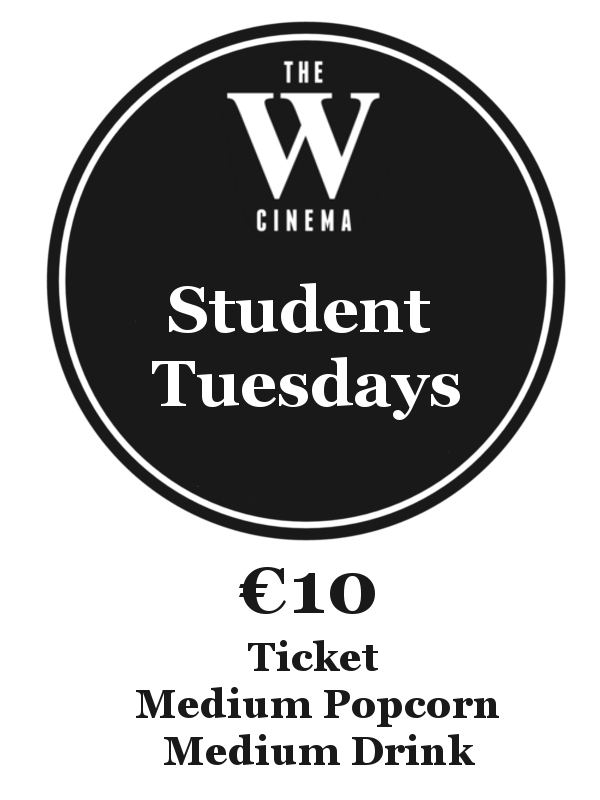 A booking fee of €0.50c/£0.50p per ticket will apply to bookings made availing of the The W Cinema internet booking system. This booking fee is the charge for the supply of the online booking service and the processing and verification of payment. If a Customer does not wish to pay this fee, it is possible to purchase tickets at the Box office in person where the booking fee will not apply. The Customer must provide the cardholders name, card type, the card number, the card expiry date and the security code on the back of the card (CVV or similar) in order to make payment for tickets. issue a refund for wrong bookings that are the fault of the customer. If the Customer experiences problems with the booking process, they are to contact The W Cinema in person or at info@thewcinema.com . By booking tickets through this website, the Customer is placing a booking order for tickets within the Terms and Conditions as outlined herein. the ticket price and the fee are non-refundable. Once the booking has been processed, the Customer will receive a confirmation e-mail to their e-mail address with all the relevant details of their booking. The W Cinema is not responsible and will not issue a refund if the Customer selects the wrong film and/or time when booking tickets via the website or if the customer is subsequently unable to attend the scheduled show or if the Customer does not meet the requirements of the Irish Film Classification Office. To collect the tickets the Customer must present and use the credit/debit card that was used to purchase the tickets in The W Cinema. Tickets must be collected within the first 10 minutes of the performance start time. The W Cinema will do everything possible to ensure the show and operating times of the cinema are true to their advertisements. The W Cinema may amend the information, products and/or services mentioned on the website or advertising at any time as necessary without notice. However due to circumstances beyond The W Cinema control there may be times that a film has to be cancelled or shown at a different time. In this instance the customer may be given a complimentary ticket or in some circumstances a refund of the ticket only. The W Cinema reserves the right to cancel a performance, vary the time of exhibition or substitute an alternative film, if this becomes necessary because of circumstances beyond our control. to the cinema. Should a customer misrepresent their age in selecting tickets no refund will be issued. The W Cinema are required to abide by and enforce the age restrictions as specified by the Irish Film Classification Office and the British Board of Film Classification. In the event that an authorised The W Cinema representative is of the opinion that the customer does not meet the minimum age requirement and the customer cannot provide photographic proof that they are of the required age, they will not be permitted entry to that performance or film. The W Cinema has the right to refuse and/or reject any customer who they believe does not meet this requirement. The website contains links to third party websites. Access to any other website through a link on the website is at the Customer’s own risk and The W Cinema bears no responsibility for the reliability of information, advices, statements, views or security on any links contained on this website. The trademarks and logos displayed on the website are the property of The W Cinema and the Customer is not permitted to use this IP without the written consent of The W Cinema. The Customer acknowledges that while The W Cinema will take all reasonable and prudent steps to safeguard the security of any payment card information the Customer imparts though encryption methods, The W Cinema shall not be liable for any damage that the Customer may suffer as a result of the loss of confidential information. The Customer acknowledges that The W Cinema is entitled to handle any personal information the Customer supplies when booking tickets through this website. The cancellation rights contained in the “European Communities (Protection of Consumers in respect of contracts made by means of Distance Communication (Reg 2001) as amended) do not apply to the sale of a cinema ticket. 1. The management reserve the right (with or without cause) to refuse admission to any person. 2. Any patron must, prior to viewing any part of the programme, purchase a ticket from the cashier; this ticket will be accepted as receipt for payment. Customers should retain their tickets while on the cinema's premises. Tickets must be presented to The W Cinema staff on request. 3. Customers should check the details on their tickets and the monetary change they receive before leaving the counter. They should also ensure that they enter the correct auditorium. Auditorium numbers are printed on each ticket and at each relevant theatre door. 4. A ticket purchased by any patron entitles entrance to the relevant theatre only once, and in accordance with the film title, time, date and censor guidelines printed on the ticket. 5. Tickets may only be refunded in exceptional circumstances and at the discretion of management. 6. Lost, stolen or damaged tickets will not be replaced. Any Customer who does not hold a valid ticket may be required to leave. 7. Customers must at all times remain within the public areas of the cinema and must not obstruct or place items in the aisles with personal belongings. 8. The W Cinema accepts no responsibility for the theft, loss or damage to any personal items brought onto the premises. representative is of opinion that the customer does not meet the minimum age requirement and the customer cannot provide photographic proof that they are of the required age, they will not be permitted entry to that performance or film. If a The W Cinema representative identifies an individual who appears too young and cannot provide identification in the auditorium, The W Cinema have the right to eject that individual from the Cinema. 10. If customers wish to obtain a ticket at a discounted rate they need to specify that before the transaction is processed. The W Cinema will not issue a refund for full price tickets purchased as a result of not following the above. Photo id may be required to confirm the entitlement. 11. Patrons must remain within permitted areas or as otherwise stated by The W Cinema staff or agents. 12. The W Cinema reserves the right to request to search patrons and their possessions before entry to an auditorium or whilst on premises. Guests who refuse to cooperate with any such search will be refused entry or removed from the premises (as applicable). Any person found in possession of a weapon, drugs or other illegal substances will be refused entry and such items may be seized and handed over to the Gardaí. Personal items deemed to be a potential health and safety risk may be confiscated until the person in possession of such items leaves the premises. 13. Patrons who, in the opinion and determined at the sole discretion of the management, conduct themselves improperly while on these premises, may be required to leave by a member of staff without any entitlement to a refund, patrons must not engage in any conduct towards, or speak to The W Cinema staff, agents or other guests in a manner which may offend, insult, intimidate, threaten, disparage or vilify any person on any basis whatsoever, including but not limited to race, religion, colour, ethnic origin, gender or that person's physical attributes. Whenever possible, we will seek to prosecute individuals who behave in this way on our premises. 14. In the event that a patron becomes abusive or unruly they may be barred from entry in the future. The Garda assistance may be sought in such event. 15. Smoking (including any electronic cigarette) is strictly prohibited in the building. 16. The consumption of alcohol is strictly prohibited in the building. 17. Photography and audio/visual recordings are strictly prohibited anywhere in the building. 18. Mobile phones may not be used in the theatres. Unauthorised use of mobile phones will leave patrons open to being removed from the auditorium. 19. In the case of an allocated seating performance customers should arrive before the start of the program. The cinema will not be able to guarantee customers their selected seats after the main feature starts. 20. Due to their nature, size or properties, certain items (i.e. backpacks, bags, helmets, sports equipment, toys, and helium balloons) will not be allowed in an auditorium. If uncertain, customers should contact a member of The W Cinema staff. 21. Food and Drink brought from outside of the cinema may not be consumed on the premises. 22. In the case of a screening cancellation or evacuation which arose as a result of a situation beyond the cinema's control, customers will be issued with complimentary tickets. Customers must present their original tickets to avail of the complimentary tickets. 23. The W Cinema takes no responsibility for goods lost, damaged or stolen while on these premises. 24. The W Cinema will do everything possible to ensure the show and operating times of the cinema are true to the advertisements. However due to circumstances beyond our control there may be times that a film has to be cancelled or shown at different time. Material published by third parties containing false or misleading information will not be responsibility of The W Cinema. 25. Please note: CCTV monitoring takes place within our premises for the purposes of protecting The W Cinema staff, guests and property. 26. The W Cinema reserves the right to amend these terms and conditions from time to time without notice. 27. These Terms and Conditions and the Customer’s use of the website are governed by Irish Law.